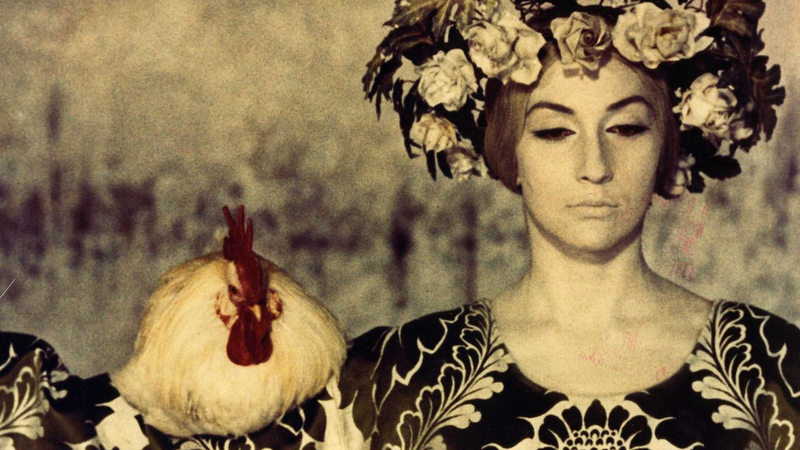 A remastered re-release of Soviet film director and artist Sergei Parajanov’s The Colour of Pomegranates, courtesy of specialist distributors Second Sight, is an opportunity to rediscover a unique cinematic experience. Cinema has not treated poetry particularly well. Either we get faithful reproductions of inciting incidents, or biopics dosed with out of focus shots of curtains and the like. For every Bright Star, there are a load of Kill Your Darlings. But Sergei Parajanov’s biography of Armenian poet Sayat Nova, the Ashug or King of Song, is a film which eschews prose and narrative and instead aims for the lucid shining mystery of poetry itself. The film presents Sayat Nova’s life through a series of striking tableaux, with the occasional title card. There’s very little dialogue as such, rather there are songs and recitals: ‘I am the man whose life and soul are torture’ we hear as pomegranates bleed onto a white sheet, a fish dies beside a loaf of bread, a white rose is compared to a background of thorns. And that’s just to introduce the poet’s childhood. The film is divided into a series of chapters: the Poet’s Childhood, the Poet’s Youth, the Prince’s Court, The Monastery, the Dream, the Angel of Death and Death. Throughout the poet is played by a series of actors: Melkon Aleksanyan as a child, Sofiko Chiaureli as a youth, Vilen Galstyan as a grown man and Giorgi Gegechkori as an old man. The Georgian actress Sofiko Chiaureli also plays other roles both male and female and her eyes stare directly out at the audience at once challenging and entrancing. Although the film shuns conventional cinematic narrative, the sheer variety of literally iconic moments and imaginative originality of the film as a whole means that the receptive viewer might find themselves dazed and occasionally puzzled but never bored. Sheep fill a church; monks chip at tombstones and the poet and his people move with the measured grace of somnambulant dancers. We are literally watching a dream. This being a symbolist work of cinema from 1968 there has also to be the obligatory dying animals scene – see the work also of Alejandro Jodorowsky – but this is an unfortunate fact of the times. A lot of the context might be elusive to a modern audience, but it will come as no surprise that the Soviet authorities balked at a film so defiantly non-literal and so difficult to pin down in the narrow constraints of ideology. Two years earlier Andrei Tarkovsky got into hot water for his portrait of the icon painter Andrei Rublev. Parajanov has a similar ambition to translate the iconic into a cinematic language: the blood, the water, the eyes and the wind that flaps the pages of the books. The iconic art from which the film takes its inspiration is at once a representation and the thing itself. It isn’t only a picture of the sacred, it is a sacred object and The Colour of Pomegranates approaches that level of mysterious unapproachable beauty.